For a fairly easy hike with a waterfall, you should try Laurel Falls near the Sugarland Visitor Center in Gatlinburg. Its roundtrip length is 2.3 miles, and the difficulty level is 2.20. This hiking trail gets its name from the laurel flowers that bloom in May along the trail and at the waterfall. At the top of the trail, you’ll meet an 80-foot-tall waterfall. The waterfall has top and bottom sections that are divided by a walkway. If you want to take your children on this trail, you should keep an eye on them since the trail is right next to some steep drop offs. Starting at the Trillium Gap Trailhead, Grotto Falls has a 2.6-mile roundtrip length. This hiking trail has a difficulty rating of 3.77. For most of the beginning of the trail, you’ll find old forest growth. Along the trail, you’ll find all kinds of flowers, including Dutchman’s breeches, squawcorn, stitchwort, trillium, and violets. This waterfall has a 25-foot height and falls into a pool of water. Grotto Falls is the only waterfall that you can walk behind, though you should be careful since the rocks can be slippery. If you’re wanting trails with plenty of wildflowers, you’ll definitely want to go on the Schoolhouse Gap trail. Starting at Laurel Creek Road, this trail sits between Townsend and Cades Cove. It is fairly easy, with a 4.83 difficulty rating, and this trail has a 3.8-mile roundtrip length. Some of the wildflowers you might see include beaked violets, golden aster, pink lady’s slippers, red clover, and sun drops. 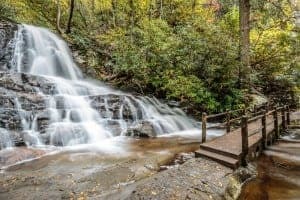 You’ll find plenty of moderate hiking trails in the Smoky Mountains, but if you want something that has streams and wildflowers, go on the Little River Trail. This trail has a 418-foot elevation gain and a difficulty rating of 5.72. It runs 4.9 miles roundtrip. Starting at Little River Trailhead, you’ll walk a cross a gravel railroad bed that runs parallel with the Little River. Crested dwarf iris, stonecrop, umbrella leaf, and yellow trillium are just some of the flowers you’ll see during April. On Rich Mountain Loop, the most diverse range of wildflowers line the trail. Blackberry, butterfly weed, everlasting pea, flame azalea, mountain laurel, sweet shrub, violets, wild geranium, and yellow ragwort are just some of the plants you’ll find. Near the beginning of the 8.5-mile trail, hikers will see the John Oliver cabin, one of the oldest buildings in the Smoky Mountains. With an 11.97 difficulty rating, this trail is considered strenuous. Plenty of other trails include features like waterfalls and wildflowers. They also range in difficulty for novice to expert hikers. While you’re planning your trip to try the different hiking trails in the Smoky Mountains, browse our available cabins for a place to stay while you’re in town!